Recorded by N. Zaks at Rubber Studios, July 2015. Fantastic release- my pressing sounds great. Completely agree with CoryJones, beautiful tracks but badly let down by the awful pressing. Really quiet and very muddy. Such a shame! The premise of these tracks is lovely, but does anybody else think the pressing is terrible? barely mixable with any other plates i own. perhaps my own is an exception, but they're extremely quiet and the highs hardly come out at all! such a shame. wonderful tunes tho as always, what else to expect from central ! The best shot in “DJ Central - ESO EP” is one of the first ones, of a vast shadow falling across the lunar surface. Visitors have arrived from beyond the solar system, and soon their presence is detected in our skies. Their ship is pretty big: “One- fourth the size of the moon!” a scientist gasps, and although an object that size in near-Earth orbit might be expected to cause tidal waves, this is not a movie that slows down for the small details. As the president of the United States and an assortment of other stock movies types look on, the mother ship dispatches smaller saucers (only 15 miles across) to hover menacingly above Earth's cities. 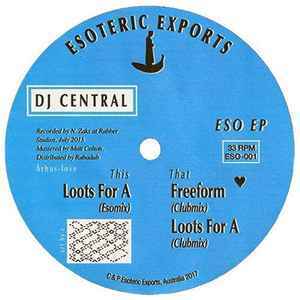 wow, this record is *****, gorgeous release, dj Central is becoming one of my current favorites, alongside CK and Ex-Terrestrial. Highly recommended!